The Swiss botanist, meteorologist and geologist Horace Bénédict de Saussure (1740-1799) is traditionally considered the intellectual father of mountaineering, by propitiating with his economic sponsorship the first historical ascent to Mont Blanc (15,781 ftm – 4,810 m), due to the interest that he felt for the different topics of scientific matter applicable to that mountain. It will be, however, on August 8th, 1786 when the two climbing experts Jacques Balmat (chamois hunter) and Michel Paccard (doctor) reach the top of the mythical damn mountain, running for Les Grands Mulets. At dusk and “to the heroic”. After spending the previous night in an improvised and fragile camp, the attack will begin at the summit without pegs, crampons or protective equipment to the current use, based on techniques that today seem rudimentary but armed, however, of large doses of enthusiasm, expertise and courage. Days later, Balmat will go to Geneva (Switzerland) to inform Saussure of the success of the company, and almost a year later, the guide-hunter will lead the aristocrat and his team to crown Mont Blanc, where they will proceed to calculate their altitude and the realization of other scientific observations. The anniversary is remembered each year in Chamonix (France), the cradle of mountaineering and the origin of the expedition, in a holiday that recalls the feat and the kick-off of the profession. A beautiful bronze sculpture immortalizes the Saussure/Balmat tandem in this French town. Not in vain, Jacques Balmat (1762-1834) is considered one of the pioneers of the discipline -as we know it today- and the technical-professional father of the mountain guides, who with the rise of nineteenth-century romantic naturalism , the expansion of the traveler phenomenon, the birth of mountaineering (as well as the andinism and himalayism) as a sport in the second half of 19th century, or the popularization of winter tourism and hiking since the 1950s, will consolidate the training, prestige and professional evolution of mountaineering experts in guiding, guidance, security, teaching and sports training for amateurs and initiates in this discipline. The spirit of Balmat survives in them today. Bold, mountain-loving technicians, solidly trained, who as vectors of their passion for the environment, inoculate their love for summits to those who hire their invaluable professional services. 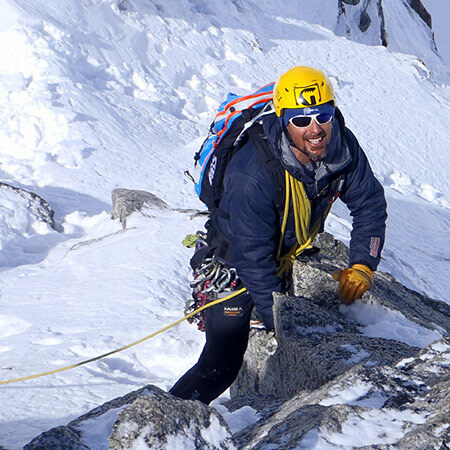 Among their recognized skills (differentiated in several levels of training performed by the guides of ravines, climbing, medium and high mountain) we can highlight technical knowledge that includes disciplines such as hiking, climbing or skiing, implementing technical skills on rock, snow, weather conditions, orientation, first aid, etc. This is achieved after overcoming a rigorous selective procedure and continuous training for several years, materialized in a certificate that combines in the figure of the experience guide, technical training, commitment and dedication. It is a demanding profession, constantly renewing, increasing knowledge, techniques and skills, with a strong component of physical demand. Their training, performance and curriculum must be accredited and certified by an approved degree and membership of the various local-national professional associations, or other transnationals such as the prestigious UIMLA (The Union of International Mountain Leader Associations), which since 2004 promotes the profession (International Mountain Leader, IML), its identity and the relationships between professionals transcending borders. The figure of the professional mountain guide (mountain leader, guide de montagne, guida da montagna, guía de montaña...) is especially valued in countries with a long mountain tradition, such as France, Italy, Germany or the USA.